SRAM introduces new X01 drivetrain components for the downhill set, including an innovative 7sp drivetrain. That’s right, I used “innovative” and “7sp” in the same sentence. Read on about clever parts for those who like to use bikes to fall off mountains in a semi-controlled manner; I myself have my eye on the 10sp version of the derailleur. 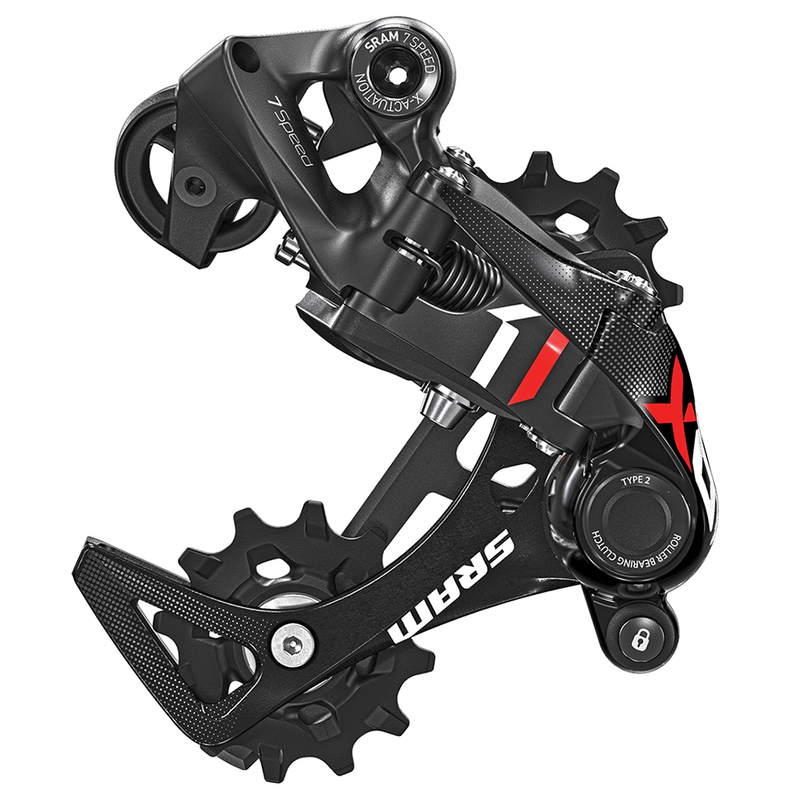 There’s a new X01 DH “X-Horizon” rear derailleur with “X-Actuation” (ie 11sp cable-pull ratio). This is a 7sp rear derailleur, but for a 7sp with 11sp chains and cog spacing not 1980s-era 7sp cassettes. There is a specific Mini Block downhill cassette. 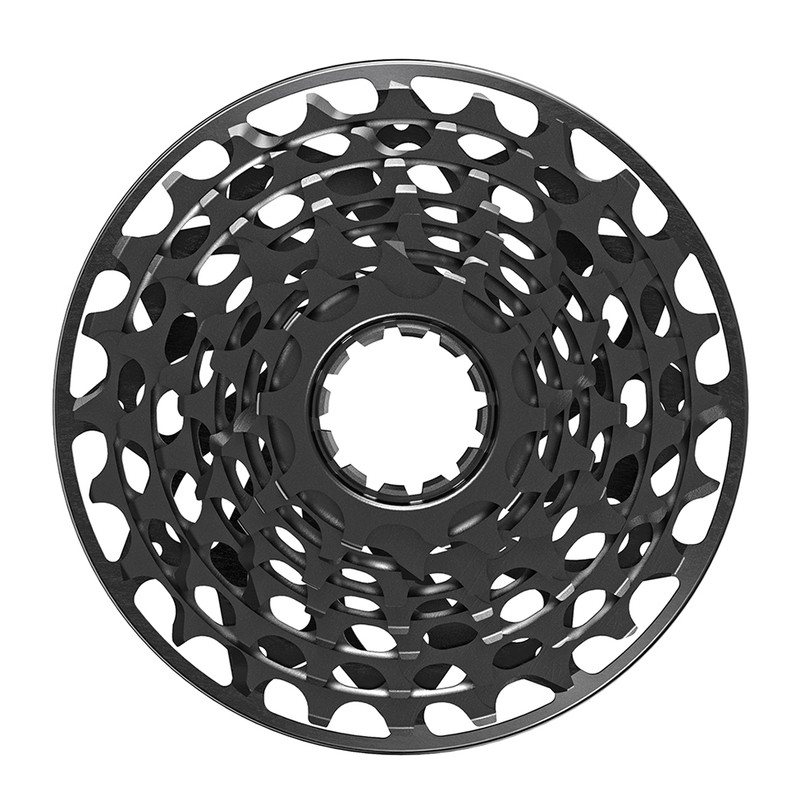 It’s a 10-24 ratio made to fit the XX1/X01 “XD” cassette body for SRAM’s 11sp cassettes. It’s an “X-Dome” construction, machined from a block of metal rather than inidividual plates. The big difference is that the abbreviated range makes use of the space after the 24t cog with an integrated chain barrier to keep your chain from bouncing into the spokes. That’s right: the cassette has a built in “pie plate”. The advantage of 7sp X01 DH cassette versus the 10sp version is that the 7sp has a 10t cog instead of an 11T. With the Mini Block cassette, the chainring can be smaller. This parallels the mini-drivers used on BMX freestyle bikes for a decade, in which the 9 or 10T cogs allow dinky chainwheels. Though downhillers won’t be trying to do grinds on rails, the increased clearance over ground obstacles is a similar desirable goal. The downside is that you still need to run those skinny, expensive 11sp chains, but at least the chainline range of that abbreviated cassette does mitigate the chainwear issues. Of course there is a X01 DH carbon crankset, which is officially compatible with both 10 and 11sp chains. Remember, those X-Sync chainrings have narrow/wide teeth to aid in keeping the chain from coming off the ring in absence of chain retention systems, so the width of the chain is a crucial parameter. You can’t use a chain wider than a 10sp. So when the crank’s spec says “7sp” compatible, SRAM mean the 7sp Mini Block cassette with11sp spacing (and thus 11sp chain). The X01 DH “X-Horizon” rear derailleur uses Exact-Actuation (aka the same 10sp cable-pull ratio as 10sp SRAM road & mtb derailleurs). This 10sp version of the X01 DH derailleur on face value doesn’t do anything that the current X0 “Type-2” rear derailleurs don’t do; they both have a clutch mechanism in the cage pivot to keep the chain from bouncing, leading to better shifting with rear suspensions, on rough terrain, and/or in conjunction with X-Sync style single chainrings. However, the X01 10sp derailleur adds “X-Horizon” (aka a non-slanting parallelogram), which tracks the chain more precisely over the profile of the cassette. This makes the X01 10sp derailleur specific to single chainring drivetrains, unlike the non-X-Horizon mechs that can handle double or triple ring setups, depending on the cage length. This 10sp X-Horizon can’t quite deliver all the range of an XX1/X01 drivetrain because there are no 10sp cassettes with a 10T cog, nor are there 10sp SRAM cassettes with cogs bigger than 36T (though plenty of companies and consumers have been hacking together cassettes with 40T or bigger aftermarket cogs). In addition to the new DH cassettes and derailleurs, there’s the accompanying shifters for the 7sp setup. In otherwords, they are X01 shifters that pull 11sp ratio but only have 7 clicks. Available in either Gripshift or trigger style. For the 10sp version, you just use existing X0 right-hand shifters.